Barbara Lyall was born on 2 March 1831 in Edinburgh, Parish of St. Cuthbert's, Midlothian, Scotland, at No. 5 Kerr Street, Stockbridge. Barbara Mill appeared in the British census of 30 March 1851 in No. 19 Fettes Row, Edinburgh, Midlothian, Scotland. Other members of the household included Barbara Lyall. She was a dressmaker, according to the 1851 census. Marriage banns for Barbara Lyall and Hugh Adams were proclaimed on 3 August 1851 at in the Parish Church of St. Cuthbert's, Edinburgh, Midlothian, Scotland. At the time of their marriage, both were residing in Edinburgh — he a coachsmith at No. 2 Pilrig Model Buildings, Leith Walk, and she at No. 17 Fettes Row, St. Stephen's Parish, Stockbridge, second daughter of the late William Lyall, painter, Stockbridge. 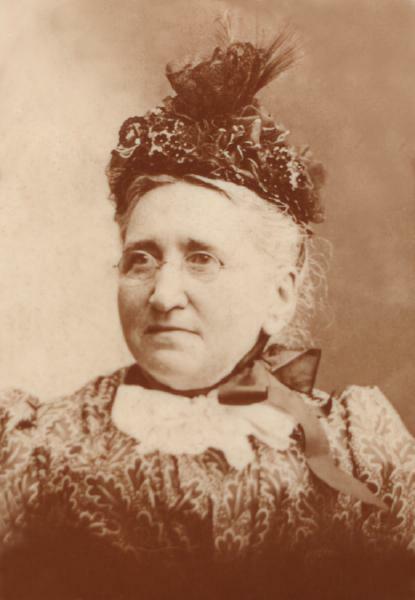 She married Hugh Adams, son of Hugh Adam and Isobel Philip, on 8 August 1851 in Edinburgh, Midlothian, Scotland, by the Rev. Robert Ferguson, Minister of Free St. David's Church. Hugh Adams and Barbara Lyall, accompanied by Margaret Adams and Isabella Adams, departed on 13 May 1857 from Scotland departing Glasgow on the Glasgow & New York Steam Navigation Company Steamship Glasgow. Hugh Adams and Barbara Lyall arrived in the Port of New York on 29 May 1857, accompanied by Barbara Mill Adams, Isabella Adams and Margaret Adams and the family went on from there to Canada. Barbara Lyall appeared in the '1859 & 1860 Toronto, Ontario, City Directory at 60 Denison Avenue. Hugh Adams and Barbara Lyall appeared in the 14 January 1861 provincial census of "Canada" in Toronto, York County, Canada West (later Ontario), at Sayre Street, St. John's Ward. Other members of the household included Isabella Adams, Margaret Adams, William Phillip Adams and William Adams. It seems very likely that servant William Adams (age 25) is Hugh's brother William, enumerated as a five-year-old in the family's 1841 household. Hugh Adams and Barbara Lyall appeared in the __ ___ '1862-1863 Toronto, Canada West (later Ontario), City Directory at 17 Denison Avenue listed as a machinist..
Hugh Adams and Barbara Lyall arrived in Buffalo, Erie County, New York, circa 1863, accompanied by Isabella Adams, Margaret Adams, William Phillip Adams and Barbara T. Adams. Hugh Adams and Barbara Lyall appeared in the New York state census of 1 June 1865 in Buffalo, New York. Other members of the household included Isabella Adams, Margaret Adams, William Phillip Adams and Barbara T. Adams. Barbara Lyall became a widow at the 27 September 1865 death of her husband Hugh Adams. She married David Harwood betw 1865-1868. David Harwood and Barbara Lyall, appeared in the US federal census of 1 June 1870 in Buffalo, New York. Other members of the household included William A. Harwood, Annie E. Harwood, John L. Harwood, Isabella Adams, William Phillip Adams, Barbara T. Adams and Anna Adams. Daughter Margaret Adams (age 14) is not enumerated with in the household. Barbara Lyall appeared in the New York state census of 1 June 1875 in Buffalo, New York. Other members of the household included Isabella Adams, Margaret Adams, William Phillip Adams, Barbara T. Adams, Anna Adams, John L. Harwood and Lyall Harwood. And David Harwood is enumerated in a boarding house elsewhere in Buffalo. Barbara Lyall became a widow at the 11 November 1875 death of her husband David Harwood. Barbara Lyall and William A. Harwood appeared in the 1876 Buffalo, New York, City Directory at 599 Main listed as Barbara, widow, and William A., engineer, boarding..
Barbara Lyall appeared in the 1877 Buffalo, New York, City Directory at 599 Main listed as a nurse, and also in the business directory in the category "Nurses.". Barbara Lyall appeared in the __ ___ '1878 & 1879 Buffalo, New York, City Directory at 599 Main listed in business directory in the category "Nurses.". Robert Thomas Wilson and Margaret Adams appeared in the US federal census of 1 June 1880 in Buffalo, Erie County, New York, at 585 Main Street. Other members of the household included Barbara Lyall, Margaret L. Wilson and William A. Harwood. Margaret's young half- brothers Lyall and John were enumerated in the Buffalo Protestant Orphan Asylum, and her sisters Barbara and Anna as servants in the household of Oliver Real. Barbara Lyall appeared in the 1885 Buffalo, New York, City Directory at 341 Virginia employed as a dressmaker..
Barbara Lyall appeared in the 1890 Buffalo, New York, City Directory at 52 Cottage employed as a nurse..
Barbara Lyall appeared in the New York state census of 16 February 1892 in Buffalo, New York. Other members of the household included Barbara T. Adams, John L. Harwood, Lyall Harwood and David Grant. David Grant and Barbara T. Adams appeared in the US federal census of 1 June 1900 in Buffalo, Erie County, New York, at 460 Rhode Island Street. Other members of the household included Barbara Lyall, Helen A. Grant. David Grant and Barbara T. Adams appeared in the New York state census of 1 June 1905 in Buffalo, Erie County, New York, at 360 14th Street. Other members of the household included Barbara Lyall, Helen A. Grant and Oliver Clark Eyeington. David Grant and Barbara T. Adams appeared in the US federal census of 15 April 1910 in Buffalo, New York, at 360 14th Street. Other members of the household included Barbara Lyall, Helen A. Grant and Oliver Clark Eyeington. The following appeared on 8 March 1915 in the Buffalo Evening News: A reception was given Mrs. B. M. Harwood upon the occasion of her 84th birthday at the home of her daughter, Mrs. David Grant, 360 Fourteenth street, last Tuesday, which was attended by 35 guests, including children, grandchildren and great-grandchildren. Mrs William P. Adams and Mrs. Grant were the hostesses. The members of the Women's association of Bethany Presbyterian church presented Mrs. Harwood with a book, "The Hearthstone," descriptive of her native land, Scotland. Many friends remembered her with gifts of flowers and other tokens. A short service was conducted by Mrs. Frederick Harper and a musical program was given by Mrs. Rosencrans and others. Among the out-of-town guests were Mrs. John Eyeington and daughter, Miss Isabel Eyeington, Mrs. A. J. Bundy and Milon Bundy. Barbara Lyall appeared in the New York state census of 1 June 1915 in Buffalo, New York, at 360 14th Street. Other members of the household included Barbara T. Adams, Helen A. Grant and Oliver Clark Eyeington. Barbara Lyall died on 7 August 1918 at age 87 in Buffalo, New York, at 360 14th Street. She was interred at Forest Lawn Cemetery, Buffalo, Erie County, New York, in the same grave with her first husband Hugh Adams.